THE MOST memorable aspect of Christmas is usually the vast quantities of food that we manage to consume. Unlike any other time of the year, we shove down the stodge, barely able to stagger from table to chair. Already though, many of us are feeling the effects of our over-indulgence – usually in the form of puffy stomachs and bottoms. Rather than returning to a normal diet, many of us continue to abuse our digestive systems with rigid ‘egg-and-grapefruit’ diets or whatever to lose the bulges we took so much pleasure in putting on. What a ritual the post-Xmas diet season is to behold! It generally starts with the glossy women’s magazines thrusting forward their idea of how we should be seen on the sunny beaches of St. Tropez (or Brighton). Their trim figured models are supposed to portray our wildest aspirations and, let’s face it, who would honestly be disappointed to discover that, overnight, without any effort, they had suddenly slimmed down to look like one of these ideal women? The same magazines offer up the ‘solution’ to all our problems. Their Harley Street specialists have thoughtfully spent their Christmas chewing over various combinations of foods that would be beneficial to our podgy figures. What nonsense. They claim it is the perfect diet for the working woman. Obviously not the sort of working woman who has to wash and dress and feed the kids and has to rush around Sainsbury’s at 7.00pm on Thursday night. 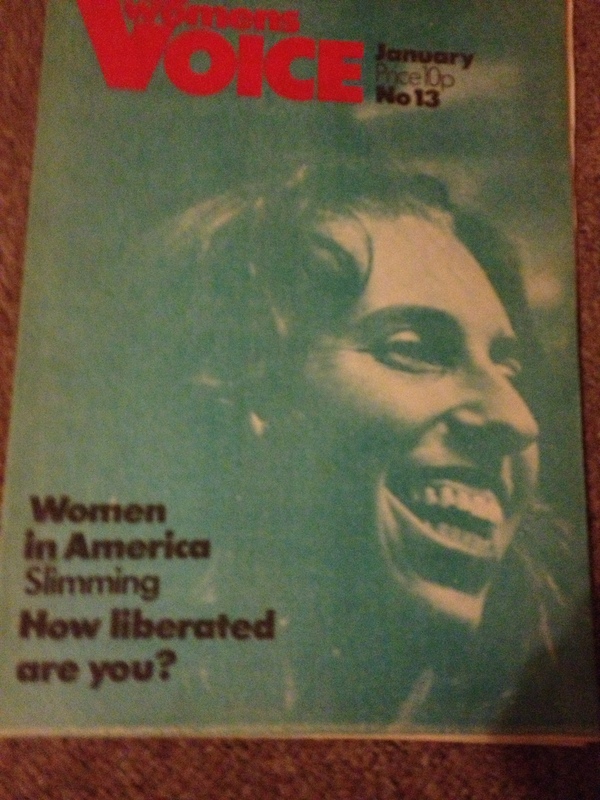 Yet this diet wasn’t in a very posh women’s magazine – do they honestly expect working class women to face the bailiffs in order to lose a few pounds? I suspect they weren’t aiming this so much at mum as at the bemused teenage daughter who may follow the general outline of the diet despite the cost and inconvenience. I can clearly remember refusing my mother’s cooking so as to not spoil my appetite for my grated-carrot-and-lemon juice (that always gave me indigestion anyway). Apart from the elaborately planned meals they command we eat, they also attempt to sell us the easy and more often than not, expensive option. Slimming pills, creams and all the rest of the rubbish pushed out on the ‘fight the flab market’ is big business. There are around four thousand slimming gimmicks on the market with an estimated yearly turnover of £80 million. One slimming cream currently being marketed claims to remove unwanted fluid in the body resulting in weight loss. It actually contains 97.3 per cent water, the other ingredient being a thickening agent called methyl cellulose. Even if it did work and did extract fluid from the body, it is still useless because it is the fat you have to lose, not water. So where does this leave us – back to the cheap and cheerful egg and grapefruit diet and the constipation that inevitably follows? We could always junk the whole idea of diet altogether of course and hope that the ‘slim is beautiful’ era will grind to a halt. Only about one-third of women who try to slim succeed in remaining slim, anyway. But would it be that easy to stop looking over our shoulders to see if the next woman was quite as plump as ourselves? I am forced to confess that I started looking over my shoulder at the age of ten when my father jokingly started to nickname me ‘his daughter, the sugar-plum fairy’. My brother didn’t exactly console me when he went to great lengths to explain how some men liked having something to cuddle. I envisaged myself more as the sophisticated well developed woman about town definitely not as the cuddly pet that everybody wants to pat with a hot-water bottle before the night-life starts. From that time on my life was a constant battle against the bulge. I’d go to a great deal of trouble to avoid meals unnoticed, usually saying that I had eaten at a friend’s. Happily, though, my obsession with weight never seriously affected my health, as usually I would weaken, sneaking down to the kitchen in the middle of the night. It is estimated that 1 in 100 young teenage girls suffer at some time from anorexia. Anorexia is an illness brought on by weight obsession. The sufferer will refuse fattening food at first, and then will become so obsessed with the idea of successfully losing weight that she will eventually refuse all food, solid or liquid. This of course leads to malnutrition and related illnesses and sometimes to death. Most of us that complain of being overweight are not anywhere near the point where our health could suffer. Certainly nothing like one in a hundred of us are in danger of losing our lives because of being overweight. From the year dot women have been puffed out or squeezed in to whatever shape was fashionable. Women have been expected to change from the shape of wasp waists and generous bosoms to the flat chested boyish look – going backwards and forwards like yoyos. Why is it that for so long we have allowed ourselves to be bullied by the dictators of fashion? It is interesting to note that whereas most ‘fashionable’ clothes are not available in sizes over 14, 47 per cent of the women in this country need a size 16 or bigger to be comfortable. It is not fear of what the editors of Vogue or Womens Own think of us, nor the bosses of the highly profitable chemical companies which flog the slimming pills and potions. It is our need to feel acceptable to men. And one very important reason this is so, is that a woman’s standard of living is going to be affected by whether she has a bloke or not. Ask any single mother. The difference in average wages between women and men manual workers is now £24 per week. Women do not have the same opportunities to be trained for skilled jobs, or even to get any job at all. A woman would find being on her own a different proposition if we had the same opportunities to get decently paid work as men. Our whole legal system, taxation, housing, social security, the health service are un in such a way as to make the single woman’s life difficult. She is not just a freak, but very likely a poor one, too. It is all these fears that the slimming industry plays on. And their adverts work (on you and me too) because the fears area real, and the problems are real. Our society does not allow men and women to freely chose either partnership or independence as a way of life, as a way of bringing up children, making our financial and housing arrangements and so on. Just get together with a group of women friends and try to get yourselves on the Council housing list and you will see what I mean. This means that all too often a relationship with a man is something we are driven into, rather than something we both freely decide to do. The dream industry of glamour and romance is built up to pull the wool over our eyes and prevent us seeing this reality, and thus we come to imagine that our relationships are built on glamour, on our looks and our figures. So loss of glamour threatens the loss of our ‘normal’ status in society. How much unhappiness is caused because of these imposed standards cannot be measured… It will be a sad day for the newspaper magnates that produce women’s magazines, and the drug manufacturers that produce both tranquilisers and slimming pills when women refuse to accept their standards. When women and men win the freedom to shrug off their conditioning and develop as complete people as opposed to interchangeable units, we won’t have the time nor the inclination to worry about the trauma of slimming. Because we will have better and more exciting things to do.